Rubenerd: The Razer antithesis to the new Mac Pro? The Razer antithesis to the new Mac Pro? With Apple's release of the Mac Pro, it's pleasing to see other hardware manufacturers also begin to rethink the antiquated AT-X tower design. We've had gradual improvements since the 1990s, but generic PC towers have always been a mess of dust, inefficient fans, spaghetti cables and memory slots so inhospitably located they would often drive me to that precious threshold which some colourfully refer to as the “brink of insanity”. Hey, at least it's not RAMBUS! But I digress. Apple solved these problems by optimising the machine for its specific uses. A single unified thermal core quietly deals with heat, and the removal of expansion slots allowed for maximum throughput for the included peripherals and cards. For expansion, six Thunderbolt 2 ports are included. Arguably the mess of internal cables were merely moved to the outside of the unit. 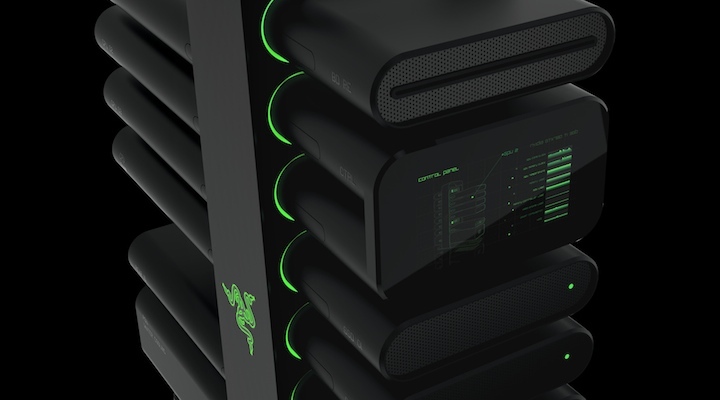 On the other side, we have this new tower concept by Razer. Playing on the strength that towers are easy to customise and expand, "Project Christine" consists of a base tower that appears to be a stand with hookups, with modules for the PSU and motherboard/logicboard. Whatever a user may want, they can plug into the tower as they would an external peripheral, but with the performance and reliability of an internal unit. It does pose a few questions, most notably how such a device would be cooled properly, and how the interconnects themselves work (since reading, it appears its PCI-E all the way). Still, its a compelling concept, despite the cliché neon green and black. Both the Mac Pro and Project Christine show there's still room for innovation in desktop computing market. I'd argue both approaches are equally valid. About all that stands to lose from this is the idea that a tower computer has to be a metal box.